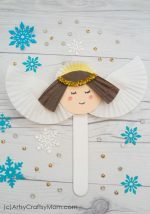 DIY Mini Camping Set Craft with Sticks and Paper: Make camping gear for your small toys and take them on a trip! 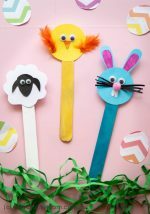 Kick off this year’s round of summer crafts with these easy to craft and great for imaginary play, DIY Mini Camping Set Craft with Sticks and Paper. 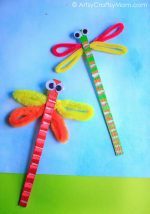 Made simply from pattern paper and a few other supplies, these tiny craft creations are a wonderful summer boredom buster idea! Bring the campsite to life with some miniature toys and pretend you are camping in a national park. Measuring tape or a ruler. Cut your patterned paper or cardstock into a rectangle 12 inch by 6 inch. We used a 12×12 cardstock & cut it in half. Use a ruler to mark 3.9 inches on the paper. Then, fold the rectangle into a tent shape by making 3 folds at exactly 3.9 inches and then pasting the extra space over the other end to form a triangle as shown below. So we have a triangle structure that’s now 6 inches wide and has a triangle at both ends. 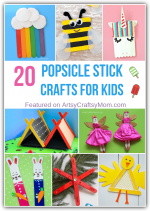 Using a low heat hot melt glue gun, affix 4 popsicle sticks, 2 at each end. Glue the first stick and then overlap the second one on top taking care to align them to the paper edge. Set up the whole Campsite by placing the blue cardstock at the bottom. The layer on top is the green felt grass. Cut out a wavy shape to resemble an actual grassland next to a lake. Sprinkle your set with artificial stones, place your tents and create a mini fireplace using stones placed in a circle ,some cut up mini twigs to form the firewood & finally red chenille stick acts like fire. Oh my cute!!! Love this idea. Thanks for sharing at the Monday Funday Party!! 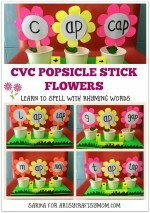 So cute and very easy. 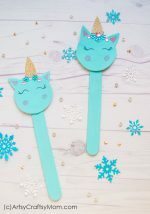 Such a cute craft…so adorable! Thanks for sharing at Welcome Home Wednesdays! I can’t wait to see what you link up next time!